If you have been diagnosed with an asbestos disease such as mesothelioma, asbestosis or pleural plaques, and believe that it was caused by exposure to asbestos during your working life—or perhaps because of exposure in other circumstances caused by a third party—you should consider your right to asbestos compensation. To make an asbestos claim in Scotland claimants have three years from any date of diagnosis, date of death or when the cause of death is established. If an employer's carelessness, recklessness or negligence have caused you to come into contact with asbestos it is important that you utilise your full rights under the law to hold them accountable, both morally and financially. This is true regardless of whether the employer responsible is still in business or ceased trading some time ago. At Thompsons, our asbestos solicitors in Scotland can help trace liability insurers so that you receive the best possible chance of justice. Thousands of people in Scotland have died as a result of mesothelioma, and other asbestos-related diseases, and even today between 100 and 300 are diagnosed with the condition each year. The progress of mesothelioma is unfortunately swift and almost always fatal, and, because of the long latency period of the illness, it usually develops decades after the time of exposure. Whether you are suffering from mesothelioma yourself or you are looking to claim on behalf of someone with the illness, Thompsons' asbestos claim experts in Scotland can help. This is also true if you are looking to claim for the illness of a recently deceased relative. It can be many years (up to 40 years in some cases) between a person being exposed to asbestos and their symptoms developing. This is true for parents, partners, children, siblings, grandchildren and dependents who have suffered secondary exposure, so it's not always easy to know where and when the asbestos exposure occurred. However, our dedicated and experienced asbestos claims team will forensically look at the evidence in your case to help establish any possible liable parties. Thompsons Solicitors in Scotland is committed to ensuring access to justice for asbestos claimants. 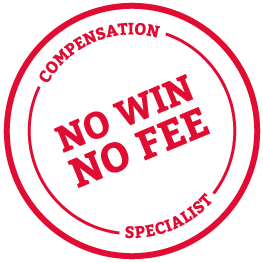 Our No Win No Fee funding deal means that you will only need to fund the cost of your asbestos claim in Scotland if you are successful. If you are thinking about making an asbestos claim, Thompsons' specialist solicitors can help you achieve justice. We have an excellent success rate - we win over 90% of our personal injury cases and recover over £1 million every week for our clients. Call 0800 0891331 today for free legal advice.